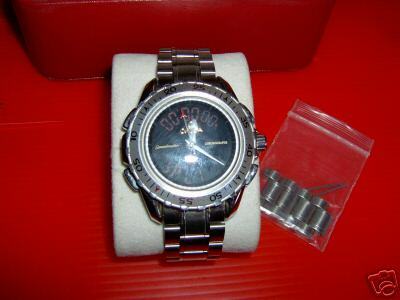 Problems, Fakes, Links – I Already Have a Watch. There have been several problems reported with the X-33 over the years, most of which were thankfully confined to early years of production. 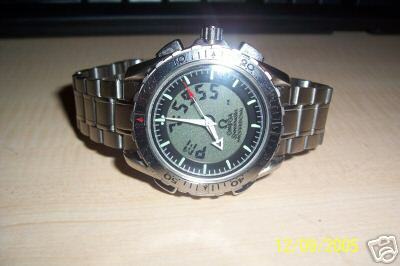 Discussion of X-33 problems on internet forums became so frequent that at points the X-33 began to acquire a reputation as a problematic watch. But as is the nature of internet information outlets, it could well be that part of the reason for the seeming frequency of problem reports within discussion forums is that the users with problems are more inclined to seek out forums and discuss them. Indeed, the reports may represent a small but vocal percentage of total production, and based on our research and and our experiences as owners the authors of this article do not intend to represent the X-33 as a problematic watch. However, there were a few specific problems with enough frequency and commonality to deserve discussion. Regrettably Omega did not handle these issues as gracefully as some might have hoped. Omega never publicly acknowledged the faults or provided explanations, though since they seem to have been corrected in later designs it might seem that Omega was likely aware of them. And sadly the disappointments and frustrations among Omega fans are not unlike those later expressed by some owners regarding durability failures early in the production of the Speedmaster Broadarrow models and 33xx calibers. 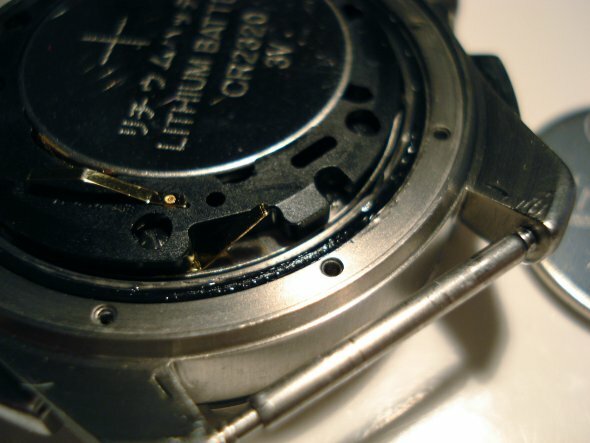 Recently Omega was reported to still repair the “collapsing crown” fault free of charge, even if outside the warranty period or if warranty documentation could not be provided. At the time of publication it is unclear if this policy is still in effect. Most of the issues were ostensibly addressed by the introduction of the 2nd Gen. model in 2001, following which the frequency of problem reports dropped dramatically. Occurrence of these problems with Gen. 2 models is relatively rare, and has even become rare with previously existing Gen. 1 X-33s. Many interpret this to mean that ghosts of early problems no longer follow the X-33 and collectors should not fear, but the more pessimistic claim that it’s simply a matter of waiting for the other shoe to drop, especially with Gen 1 X-33s. At one point there seemed to be a particular rash of complaints from military users which unfortunately did significant damage to the watch’s reputation in the eyes of some. Perhaps this was because the custom-built military pieces were assembled in relatively small batches, which can challenge efforts of standardization and quality control. As well, military users may also be among those who demand the most from a watch, subjecting it to the hardest use and worst abuse. In any case, problem reports among the military owner population seem to have since declined and the X-33 remains a popular choice among military pilots. This is perhaps the most commonly reported fault of the X-33, in which the crown seems to become mushy and “collapse” into the case, failing to actuate the module when depressed. 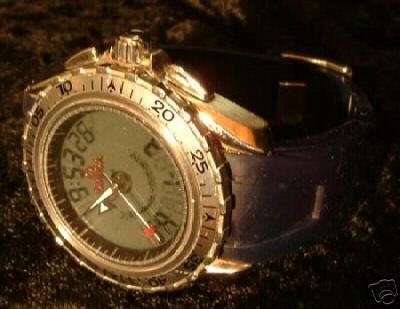 This is a critical failure because the watch’s functions can no longer be used without the crown. Reports of this problem on Gen 2 X-33s are uncommon. Just like it sounds – pushers would separate from the case. Less common. Known to have happened aboard the ISS. This was high among the complaints of some military pilots, especially as foreign objects floating about the cockpit can be critically hazardous during flight operations. Additionally, there were confirmed reports of an astronaut experiencing this fault aboard the ISS during a mission. The apparent cause in many cases seems to be a failed crown release detent which typically can’t be repaired at the user level. Despite its “bulletproof” mystique and high strength-to-weight ratio (roughly 5 times stronger than steel on an equal weight basis), Kevlar can be a temperamental fiber to work with in finshed textiles and is not without vulnerabilities. Kevlar is susceptible to breakdown from ultraviolet light exposure and long-term water exposure or repeated washings, especially if the design of the finished product does not “seal” the Kevlar fibers well through lamination or other means. The earlier double-ridged versions of the Omega Kevlar straps suffered complaints about durability and fraying/unraveling, as well as complaints of stiffness and discomfort. The newer "flat" version of the Kevlar strap seems to have addressed these vulnerabilities as complaints are now rare. At its release the X-33’s precision was stated at an astonishing (if perhaps over-optimistic for a non-thermocompensated movement) +/-0.1 seconds per day. However, many owners did not observe the stated accuracy and some pursued adjustments under warranty attempting to bring it into spec with varying degrees of success. 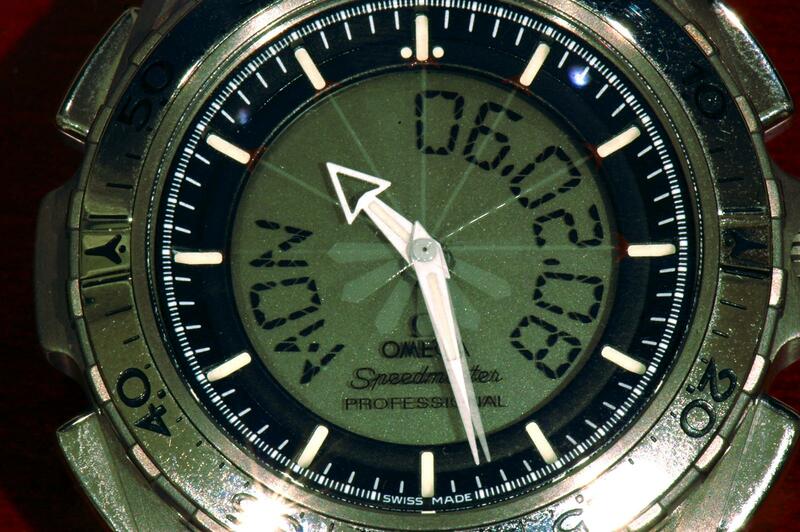 Omega downgraded the advertised spec in short order to a less lofty +/- 0.3 – 0.5 sec/day, and then shortly thereafter no accuracy specification at all was given in manuals and promotional literature. In some cases, the second and/or minute hand may not strike perfectly on the index markers at the outer edge of the dial, either completely or partially about the circumference of the dial. 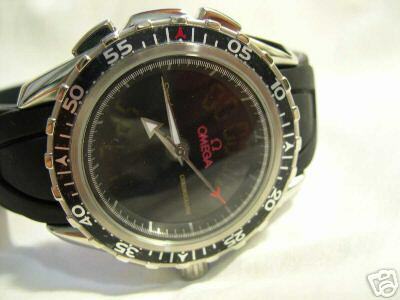 Sadly, this shortcoming is not limited to the X-33 and is unfortunatley also a somewhat common complaint with other Omega quartz models of this period. In some cases a watchmaker can correct/improve the problem by removing and re-setting the hands if the error is a consistent offset all the way about the dial. In other cases there is little that can be done. Fortunately this problem is not common to every X-33, and in some cases users have noted that the severity of the problem seems to vary across battery life. Timekeeping is unaffected. Note: in some cases this may be a simple problem of parallax owing to an offset viewing angle, and might be improved by simply looking at the watch straight-on. Some users complain of a high-pitched electronic whining noise when the backlight is activated. This barely audible, high-pitched sound is a characteristic of the on-board transformer that coverts the low-voltage DC current from the battery to the high-voltage, low current AC supply required for the EL (Electro-Luminescent) backlight. This can be in the range of 100-200vac though at very, very low current. This “whine” is common to all EL displays, not just watches and not just Omegas, and is not the result of any design flaw or hardware fault, though some designs are better than others at minimizing the perceptible noise. Occurrence of this complaint seems to vary by watch and user (just how good is your hearing…?) and seems to vary as well over battery life according to some users. By design it’s supposed to under certain circumstances! This is not a problem at all but a design feature that is clearly described in the owner’s manual yet misreported as a problem with surprising frequency. battery is weak and should be replaced soon. This problem can also present and/or persist right after a battery change if the battery was not installed properly or was old or of inferior quality. Proper (re-)replacement with a fresh, quality brand name cell will usually resolve the problem. The 5-second skipping second hand of the battery EOL (End of Life) Indicator. the rest of the watch’s functionality seems unaffected. The obvious solution of course is to replace the battery. Like above, this problem can also present or persist following battery replacement if an old or low-quality replacement cell is used or the cell is improperly installed. The solution may be as simple as replacing the battery (again, if necessary). Note the low-quality Chinese replacement cell that caused Zaphod to have to replace this battery within a few weeks of making this tutorial! carefully, one is along the outer circumference of the battery). Mission Elapsed Time (MT) Rollover: if the Mission Elapsed time is allowed to continue beyond the 999-day limit the function will hang. So perhaps the X-33 wasn’t well-suited for a mission to Mars after all, as the shortest estimates run about 3 years and would be beyond this limit. This problem is known to occur on Gen 1 versions of the X-33. inclusion of the Leap Day). This was on a Gen 1 X-33 and predates the release of the Gen 2 version. It is not known if there were further errors in the perpetual calendar on either version. Erroneous 367th day error displayed on Gen 1 X-33. *Special thanks to Frank_be for the images in this section – nearly all of them were previously featured in an excellent post by Frank on WUS. While there are some fake X-33s out there they are fairly uncommon, and fortunately for collectors most fakes are easy to spot with just a minimum of knowledge. The multifunction analog/digital movement is uncommon enough that is relatively difficult to fake using off-the-shelf ebauches, and combined with the relatively low market demand for the X-33 during its retail lifespan there was little incentive for the fakers. Most fakes have multiple faults or errors that are immediately obvious with even a cursory inspection as shown below. All genuine X-33s originally had the serial number engraved on the underside of the 7 o’clock lug. However, even genuine X-33s sometimes have the serial numbers ground away by gray market dealers so this is not necessarily a sure-fire indication of a fake. But fakers seldom bother with numbers at all or tend to reproduce the same number over and over. The titanium case and bracelet of the X-33 have a distinctive matte gray finish with polished steel accents. Fakes are typically made of inexpensive shiny metals with incorrect flashy polished surfaces where there should be dull matte titanium. The minute hand on the X-33 "jumps" in discrete half-minute increments as the second hand passes :00 and :30. Fakes seldom bother with the engineering necessary to imitate this unique feature and often have continuously moving minute hands. It’s probably not a fake. As said above fakes are uncommon and typically very easy to spot, and with the limited retail popularity of the X-33 there was relatively little incentive for the fakers. If you’ve gotten this far without spotting any obvious flaws the watch is likely genuine. 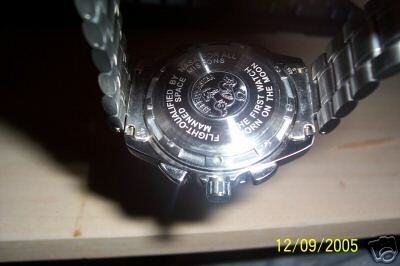 This is among the better fakes but has too-prominent pushers and crown as well as an incorrectly positioned and formatted LCD readout. Thankfully, this is one of few fake X-33s that might make it past a cursory inspection undiscovered as a fake. 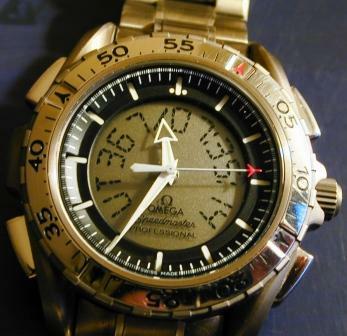 Reverse of the above showing incorrect caseback design and incorrect engraving similar to that of the original Speedmaster Professional from which it was presumably copied. The X-33 of course was not “The First Watch Worn on the Moon” by any stretch of the imagination, having been released nearly three decades after the fact and as yet never having been to the moon! Though the red logo is amusing and this time it’s on a rubber dive strap, the dial and LCD readout are even more incorrect. Not even close! Polished case and lugs, black LCD and bezel insert, incorrect "Broadarrow"-style hands, red logo, etc. 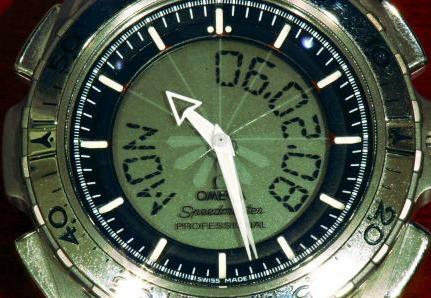 Some have noted that the design of the fake seems oddly prescient as it looks somewhat similar to the Omega Seamaster Planet Ocean released years later, especially on the rubber strap. Another of the same strain with incorrect black LCD display, though on a bracelet and with a light-colored bezel insert this time. The fakers were even thoughtful enough to include spare fake links! 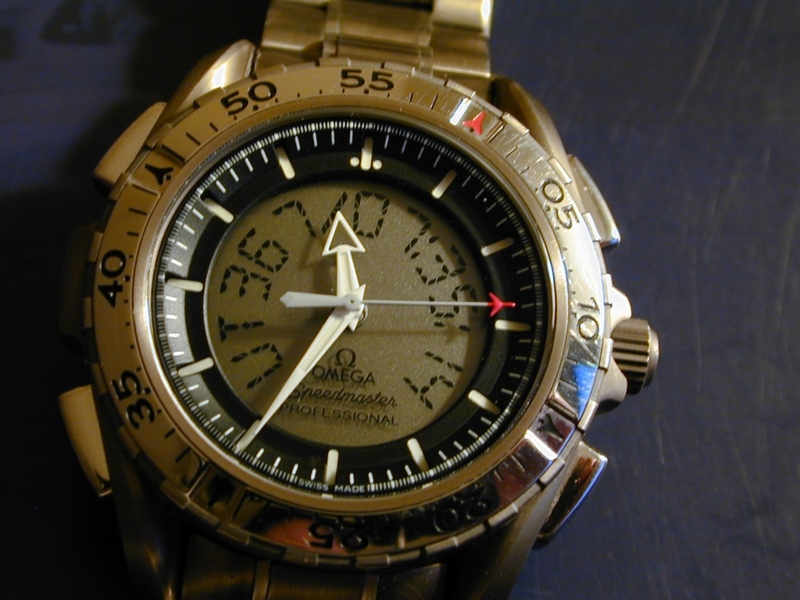 Omega Official X-33 Product Page – though the link to it has been removed from the current model lineup the page is still there hidden away in the webspace if you know where to look. Be sure to click the “See it in real time” link for a java applet demonstrator complete with backlight and alarm! And though after all these years it perhaps remains the most famous review of the X-33 on the net, its author was later disappointed when his X-33 finally gave up the ghost after nearly 5 years of service. Gen 1 to Gen 2 Conversion – by Craig Rodgers. Yes, it can be done if you’re so inclined, and Craig shows us how in this photo tutorial. Good Day! I have a question about my new (to me) gen 1 X33 that I’m having a hard time finding the answer too. Is it possible to have the cal 1666 X33’s UA alarm go off every day, or only on specified Julian dates? If it’s possible, how do you get that to work? Mine currently only lets me cycle through dates, not giving a — option like the Skywalker X33 line.